Bespoke design on the Coca-Cola Kings Cross billboard. 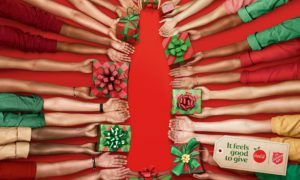 Coca-Cola Australia has today launched its ‘It Feels Good to Give’ Christmas campaign, in partnership with the Salvation Army, for the second year. Following a successful debut in 2017, the campaign will again star the Christmas truck which will tour the country on a 10,000km national tour of cities and towns.